There are many reasons to visit Madrid, Spain, the monuments, museums, architecture and history or the nightlife, fiestas, food, and great shopping. There are hundreds of hotels in Madrid and many of them offer very appealing accommodations for the budget minded traveller. Located right in the heart of Madrid, the following hotels are certain to meet a budget traveller�s needs. The chic and basic Atocha is ideal for singles or young couples seeking basic comfort and great affordability. This hotel, with 36 rooms is modern and ultra simplistic with minimal furnishings. On the rooftop, guests will find an equally simplistic, but attractive sun terrace for great relaxation. The THC Latina Hostel offers very clean and affordable accommodations. This establishment, with only 10 rooms, is a hidden retreat perfect for couples seeking romance. For a small fee, guests may schedule special day tours or evening excursions or may venture out on their own to find great restaurants, shops, and museums. Customer rankings indicate that the High Tech Nueva Castellana Hotel provides great value for money. 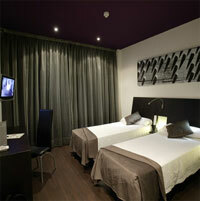 This high tech hotel is ideal for business travellers as it is located in a high tech area of Madrid. 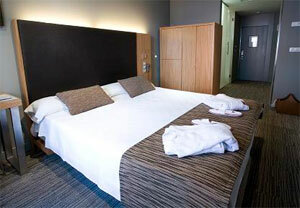 However, a young couple or families seeking a bargain will also be pleased with this hotel. Rooms with king beds, two beds, or a king bed and a set of bunk beds are available and will accommodate a variety of needs. Guests will be pleased to find Wi-Fi and even personal notebook computers in each room. Rooms also offer hydro-massage showers and hydro-massage saunas, comfortable beds, and fresh linens all to insure great comfort. With a central Madrid location, visitors have access to monuments, nightlife, shopping and restaurants all of which will make for a wonderful visit. 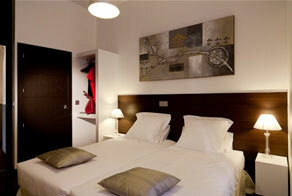 Click here for more cheap hotels in great Madrid locations. Visitors will find that the Petit Palace Tres Cruces, will provide an upscale, but affordable stay for young couples as well as families. Choose a room with a king bed, or if the kids are along, request the family room and enjoy a king bed and a set of bunk beds. These rooms are attractive enough to please adults and roomy enough for the kids. Enjoy the flat screen television and the notebook computer with free Wi-Fi service. It is an easy walk, even for the kids, to restaurants, shopping, and museums, for some additional fun; borrow complimentary bicycles, and take a ride. The hotel will provide a map of the best bike routes and will assist guests with information about what to see and do in this amazing city. The rooms here offer some special amenities such as hydro showers and tubs, in room exercise bikes, and a trouser press. For comfort and ease, the hotel offers breakfast, for a fee, in the nicely appointed breakfast room. Book at the Petite Palace Tres Cruces and receive two tickets for entrance to a museum or special exhibition or book the family room and the kids will receive a gift. For business travellers, mature couples, young couples and families, it is quite possible to find affordable and attractive hotels in Madrid that will ensure a happy trip.